It's finally here! 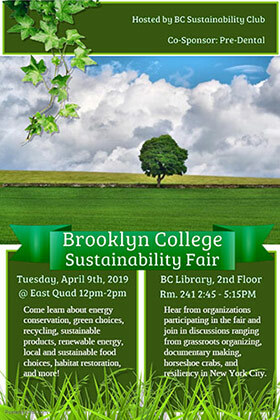 Brooklyn College students, faculty, and staff are invited to show off the college's commitment to sustainability and protecting the environment by participating in Earth Month–related events throughout April, including our free screening of Paris to Pittsburgh on April 2 and our Sustainability Fair on April 9. 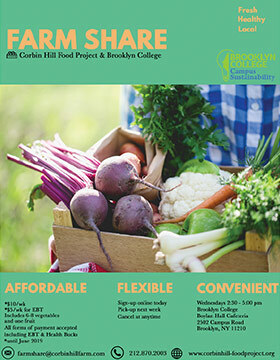 The Brooklyn College farm share is here; distribution happens every Wednesday. Sign up today! All shares include six to eight vegetables and one fruit. Popular add-ons include organic eggs, flour, and the winter fruit share. New 2019 add-ons include yogurt, cheese, and juice. All forms of payment are accepted. Make your payment a week prior to the distribution date. The mission of Brooklyn College's sustainability initiative is to create an overarching culture of sustainability throughout the entire campus community by raising awareness of, engagement in and commitment to reducing our carbon footprint through campus-based education, research, operations, community-based collaboration, and service. Our sustainability planning will take special recognition of the constraints, opportunities, and responsibilities attendant with our urban location in one of the most densely populated cities in the United States. Goals for advancement in each of these areas are included in Brooklyn College's 10-Year Sustainability Plan. This plan guides the college's green initiatives, in conjunction with the CUNY Sustainability Initiative and PlaNYC and in partnership with businesses, government, regional and citywide organizations. See the Brooklyn College campus sustainability video series, winner of the 2018 CUNY Sustainability Competition! What Is Brooklyn College Doing? Filling up your own reusable bottle at home with water instead of buying a bottled water or sugary drink not only saves you money, but also drastically reduces the number of bottles that aren't recycled and end up decaying in landfills for centuries. Check out our new hydration stations on the first floor of Boylan, Ingersoll, James, and Whitehead halls, and the library. Alkaline and rechargeable batteries can be dropped off in the recycling tubes found on the first floor of most buildings across campus. 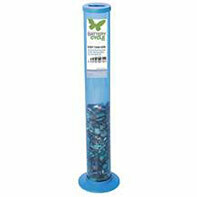 Call EHS at extension 4268 for pick-ups of larger batteries.